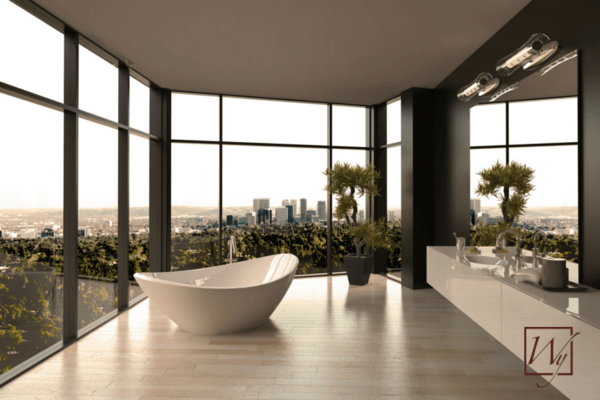 What Does Radiant Floor Heating Cost in an LA Bathroom? It probably comes as no surprise that homes in Los Angeles — also known as the City of Angels — generally carry a not-so-heavenly price tag. In fact, the average home price in Los Angeles is just more than $440,000. That's more than double the national average. In parallel with these high-end prices, many California homeowners are looking for upscale upgrades that can add value and functionality to their homes without breaking the bank. Adding in-floor heating is one cost effective way to do so. Although in-floor heating might sound like an unnecessary upgrade for a California home because of the warm climate, this area is actually ideal for electric radiant floor heating. The LA area boasts moderate temperatures year-round, but they typically drop at night. Therefore, in-floor heating can be used to keep inhabitants warm at night without running all day long. For instance, a floor-warming system in a bedroom can keep residents warm where they sleep. Plus, radiant floor heating can warm up cold bathrooms in the morning and at night so that homeowners are fully pampered during their morning and/or nighttime routines. In fact, heating a large bathroom for two hours in the morning and two hours at night costs less than a quarter per day in operating costs. 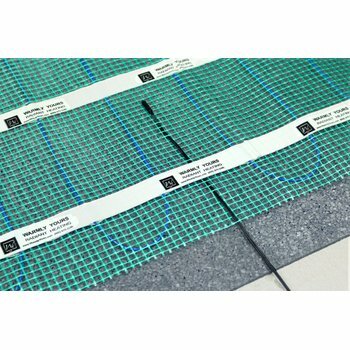 How much does electric floor heating cost? 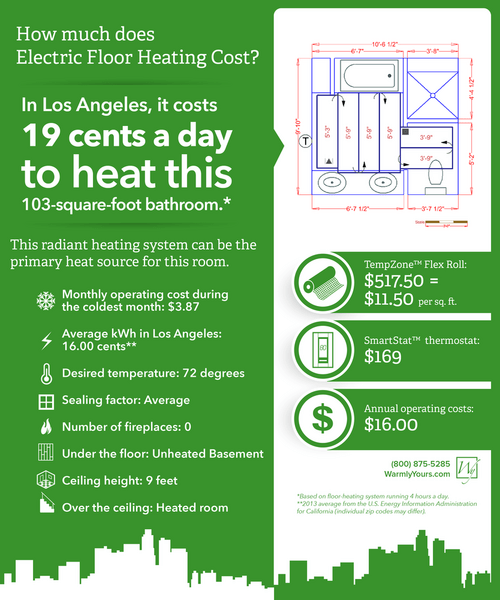 According to WarmlyYours' Energy Use Calculator, it costs 19 cents a day to heat a 103-square-foot bathroom (see floor plan) in the Los Angeles area. WarmlyYours' Heat Loss Calculator also shows that it only costs $16 to heat the room for the entire year*! That's less than it costs to refill a tank of gas after driving all day on the 405! This bathroom utilizes one 120-volt, 1.5- by 30-foot TempZone™ Flex Roll, which is cut and turned to fill the 45 square feet of floor space in the room. The roll itself costs $517.50, and the SmartStat™ thermostat needed to operate the roll costs $169. That brings the materials total to $686.50. Unlike the cost of real estate in California, the cost per square foot of electric radiant heating is far lower. It costs $11.50 per square foot (excluding the price of the thermostat) to heat the floors of this bathroom. However, the experienced DIYer can lower this price even further by purchasing TempZone™ Cable. This is a more labor-intensive option, because the cable must be installed by affixing it to plastic strips back and forth throughout the room; however, it is very affordable. Other than the product format, it should be noted that TempZone™ Cables are different from TempZone™ Flex Rolls because they have a lower wattage: 12 watts per square foot when spaced 3 inches apart. TempZone™ Flex Rolls offer 15 watts per square foot. To determine if TempZone™ Cables can act as a primary heat source for a room, homeowners should use the WarmlyYours Heat Loss Calculator. In the City of Angels or any other city, WarmlyYours brings heavenly comfort and warmth to homes with its full line of radiant heating products. The warmth radiating up from the floor or from a towel rack or radiant panel is like the touch of an angel and the answer to your dreams of spa-like luxury. Get started on your own project using WarmlyYours' Instant Quote tool. 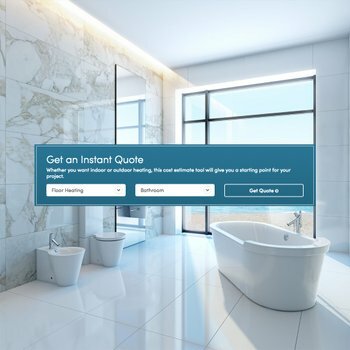 Within seconds, you'll find out which product you need and how much it would cost for your specific room. To receive a detailed installation plan, send us a floor plan. 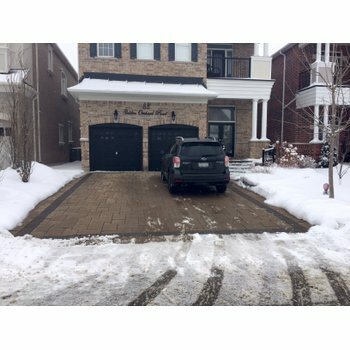 Our team will get back to you the next business day with a free quote and custom installation plan so that you can see exactly how your floor-warming system should be installed. If you're tackling the remodeling project yourself, we have technical support experts available to you 24/7 to answer any questions. Just give them a call at 800-875-5285. *Based on the 2013 average of 16 cents per kilowatt-hour in California, according to the U.S. Energy Information Administration.